Boats along the shore of Lake Victoria surrounded by water hyacinth. Nairobi — Nairobi Governor Mike Sonko has challenged conservationists to save Lake Victoria from the water hyacinth that has choked the fresh water lake. Sonko has said the floating weed which has so far covered 360 hectares of the lake has hampered the movement of people and fishing within Lake Victoria. Speaking on Tuesday while addressing the Sustainable Blue Economy conference at KICC in Nairobi, Sonko challenged leaders and environmentalists to find a solution to the hyacinth menace that has hindered the growth of the Blue Economy within Lake Victoria, which is the second largest fresh water lake in the world. "It's not okay that all the environmental experts are unable to find a solution to this menace. We should make a resolution in this conference that we will now allow factors to negatively affect the Blue Economy without concerted effort to address them. We need to find a way to permanently remove this weed. We owe it to our people," said Sonko in his speech during the conference. 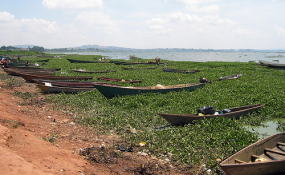 Lake Victoria borders Kenya, Uganda and Tanzania, and the Kenyan side is the most affected by this hyacinth weed. The governor has meanwhile called to an end on pollution of our oceans, lakes and rivers, terming it a danger to all mankind. But Sonko has hailed the recent ban on the use of plastic bags by the Kenyan Government saying the decision has drastically reduced the amount of plastics ending up in our rivers, lakes and ocean. "We must conserve our environment. Ocean, lakes and rivers pollution poses a danger to all mankind. Kenya recently banned the use of plastic bags, most of which ended up in dumpsites and into the water system, he added. "Our oceans and lakes offer us immense potential for employment, agriculture, tourism, energy, industry and travel. With it, we can end hunger, provide livelihoods and improve our standards of living. It is up to us to harness this potential," stated the governor. He has in the meantime promised that his administration will intensify a campaign to clean up the Nairobi rivers ecosystem. "In the last four months, we have removed hundreds of tons of waste from our rivers and are now conducting a campaign to sustain the momentum," he said. Speaking during the same forum UN-Habitat Executive Director Maimunah Mohd Sharif welcomed the ongoing beautification exercise by the Sonko administration saying the Nairobi City County Government is a great example of how to manage our environment. On his part, Devolution Cabinet Secretary Eugene Wamalwa also hailed the Nairobi City County Government beautification exercise.